Two weeks ago raids and arrests in several European countries took out several prominent websites. Aside from the main target, movie streaming links portal Kino.to, the raids also affected several file-hosting sites including Duckload.com. Despite taking a big hit Duckload is not giving up. Instead, the site has respawned with a full-blown movie streaming site that's already generating millions of page views a day. On June 11th Europe witnessed one of the largest piracy-related busts in history. The popular movie streaming portal Kino.to was shut down and more than a dozen people connected to the site were arrested. As the result of collateral damage, several file-hosting services connected to Kino.to also went down. One of the file-hosting sites that suffered due to the raids was Duckload.com. The cyberlocker site lost 400 servers, worth more than 2 million dollars in total. In addition, the police also went after one of the admins of Duckload.com for his involvement in the site. However, despite being struck hard the site is not planning to quit their business anytime soon. Instead of lying low, the people behind the site quickly redirected the Duckload.com domain to Video2k.tv, a site that is probably an even bigger threat to the entertainment industry. While Duckload was merely a file-hosting service, the new project is a complete video streaming portal, without ads and free of charge. Looking at the traffic the site is on the right path to make this goal a reality. Just a few days after the site went live there are already close to 2 million page views a day, and this number is increasing rapidly. Many users come from German speaking countries, as the site is a direct replacement for the raided Kino.to, but the goal is to conquer the rest of the world as well, TorrentFreak was told. Looking at the site’s features, it’s no surprise that many people are flocking to the site. Video2k.tv features the latest movies and TV-shows, all of which can be streamed instantly. 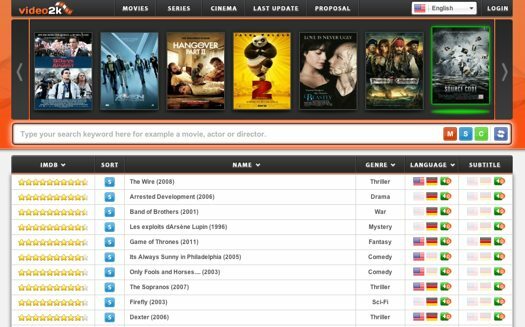 The site further offers subtitles and allows users to sort results based on IMDb rating, genre and much more. Combined with a completely ad-free layout, the site will no doubt appeal to a large audience. This popularity comes at a cost though. The site will not go unnoticed to the various anti-piracy outfits either, which will make it a likely target of future actions by the authorities. However, talking to TorrentFreak, the Video2k.tv admin said that they are more than prepared. “We have servers in three different locations around the world for now, and the goal is to add two more in the near future. If one place is raided we will switch to a new one,” he said, adding that they also have some 50 domain names in case the current one becomes the target of a seizure. Without a doubt, Video2k.tv’s determination will be used by the entertainment industry to call for more tools to combat piracy, such as the PROTECT IP Act. Where that will lead and how it will effect the Internet is something that will undoubtedly become clear in the months to come. Note: At the time of publishing Video2k.tv is dealing with a DDoS attack, causing the site to load slow or not at all.